Amtrak plans major update for Union Station in Washington, D.C. - Archpaper.com Amtrak plans major update for Union Station in Washington, D.C.
Last week, Amtrak announced a call for contractors to bid on a proposal to modernize and expand the railroad’s main concourse at Union Station in Washington, D.C.
Union Station is Amtrak’s headquarters and the second busiest train station in the country, yet its cramped and narrow concourse has been in desperate need of a face-lift since it was built in the 1980s. While the station has retail and food options, it is plagued with long lines and overcrowding, and lacks bathrooms. Union Station, which is swamped by nearly five million passengers each year, is known for its infamous train boarding process, where riders are forced to wait on the concourse instead of the platform of their specific train. The disorganized space often creates winding lines and very confused passengers. 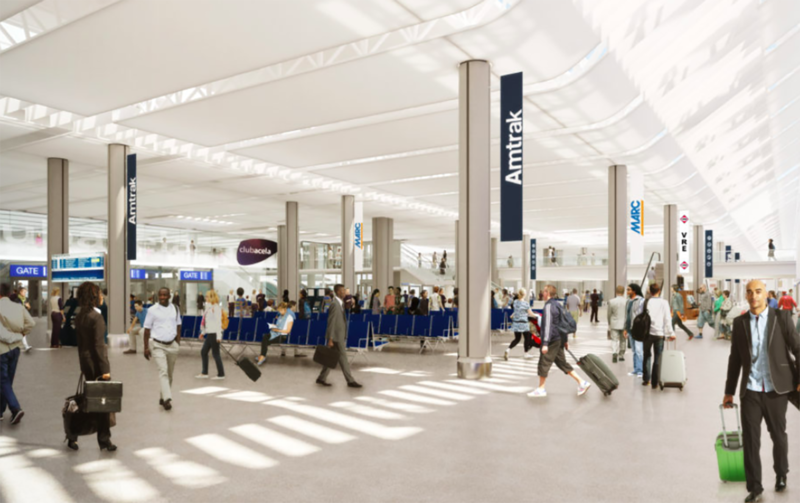 Amtrak’s project aims to double the capacity of the 70,000-square-foot space by creating a more open, flexible, and spacious interior layout. The scheme will undoubtedly modernize the space which will no longer be confined by restrictive walls, doors, and hallways. Passengers will be able to flow freely throughout the open concourse, which should alleviate congestion and minimize the stress associated with boarding and queuing. The plans also involve a generous amount of glass and natural light, which will both brighten the space as well as improve overall aesthetics and comfort. The addition of more bathrooms and a luxury, 10,000-square-foot lounge will further provide visitors with a more positive, streamlined experience. This isn’t the first time Amtrak has sought to revamp Union Station. In 2012, the railroad service unveiled a multi-billion-dollar proposal to remodel the concourse. Without proper funding, the plans were scrapped. Construction of Amtrak’s most recent vision is anticipated to begin this fall, and completion is slated for 2022. While the news may be exciting for frequent passengers of Union Station, it still will not fix Amtrak’s inconvenient boarding process. Amtrak D.C. Union Station Railroads Washington, D.C.